Don't be fooled...Not all EMR's are Certified! Are you Concerned with Meaningful Use and if your EHR and EMR software you presently use will meet the requirements as stipulated by the Federal Government? You're not alone! Many EMR's especially the "Free" Versions are not certified at all. 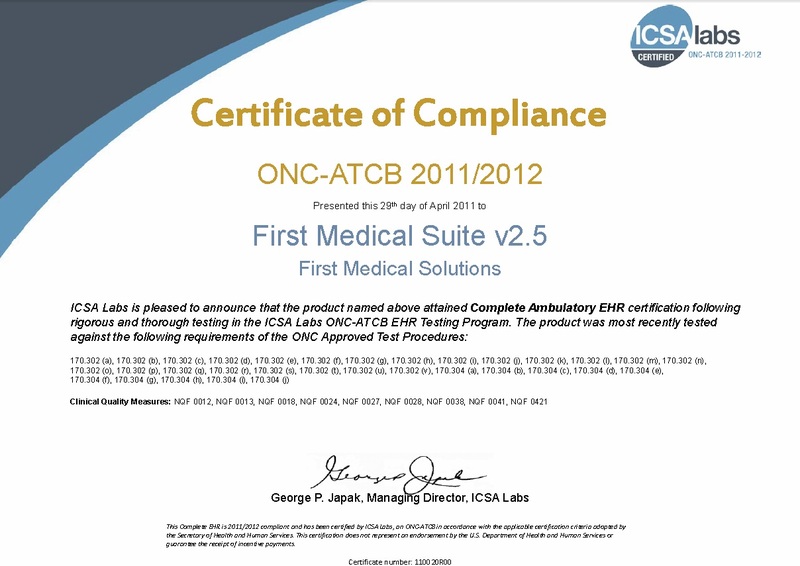 V2.5 is 2011/2012 “Complete Ambulatory Certified” as an approved EHR software solution by the world recognized ICSA Labs. You can rest easily knowing that First Medical Suite EMR solutions and modules are qualified and meet the requirements necessary to be compliant. The information on this page is currently hosted by the HITRC and its Partners under contract with the Office of the National Coordinator for Health Information Technology.